I represent the Balance Point Racing Club, and I know that this is an important role. I act in ways that bring respect to my coaches, my team, the governing body, and myself. I communicate first with my coach if there is an important matter. I use acceptable language at all times, and I speak positively of others. I cooperate with coaches, officials, volunteers and fellow athletes. I try to be a good role model for other athletes. When I train I always try my best. I set goals and work with my coaches to achieve the goals. I listen to and show respect for my coaches and all my teammates. I will not participate in practices or display behaviors that are considered to be infractions (click on image to the right to table). I will report immediately to a coach when there is a situation in which someone (this includes me) has been hurt or could potentially be hurt. 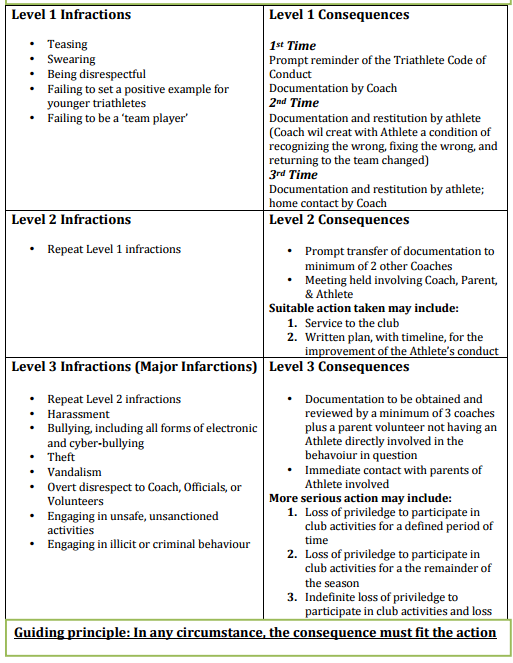 All Balance Point Athletes will obey the Athlete Code of Conduct. All Balance Point Athletes understand that failure to obey the Athlete Code of Conduct may lead to loss of the privilege to compete or train as a member of the Balance Point Racing Club.